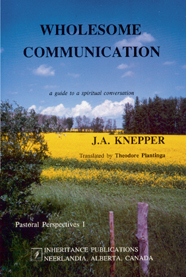 Henry Vander Kam in Mid-America Journal of Theology: The importance of this book is far greater than its small size . . . The author also deals with the office of all believers. He does so in the sense in which the Bible instructs us in this matter and as it was emphasized again by the reformers. K.V. Warren in Vox Reformata: Here is plenty of practical and down to earth advice as regards the ins and outs of conversation in general: non-verbal communications and its importance, posture, value judgments, leading and structuring a conversation, etc. 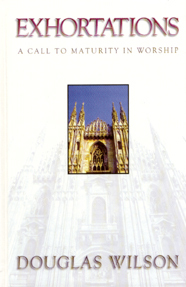 G. Duncan Lowe in Covenanter Witness: This book deserves to be read throughout the Church. It is a manual of practical godliness within a clearly important area, and it is written by a man of experience and sensitivity who continually reflects upon God's Word. 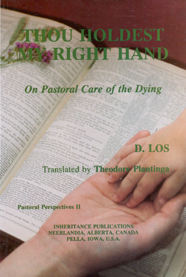 Johan D. Tangelder in Christian Renewal: A much needed book, which should be in every church library, and mandatory for all involved in ministry to the sick and dying. A series of publications of the Reformed heritage and the observation of whatever might endanger the same. Home visitation is a long-standing practice in Reformed churches. But why do we go through this exercise year after year? Does it really benefit the life of the congregation or is it merely a custom we follow? Is there enough direction for those who bring such visits and for those who receive them so that the practice is not robbed of its meaning? How do we keep it from degenerating into a mere routine? These are some of the questions that are addressed by the author of this book. To rediscover Gods gift of eldership for the church today, we need to go back beyond the New Testament to the origins of the office of elder in ancient Israel. There we discover the enduring principles that guided the elder in antiquity and that guide the church today. 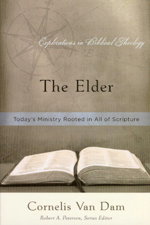 In this book you will develop a renewed understanding of the office of elder and of godly discipline. 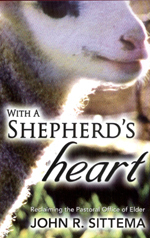 John Sittema gives elders a fresh and thoroughly Biblical perspective on their work as shepherds in the church. Our elders have discussed many of the authors articles previously published in "The Outlook" with great profit. This book makes being Reformed exciting. Send mail to orders@inhpubl.net with questions or comments about this web site.